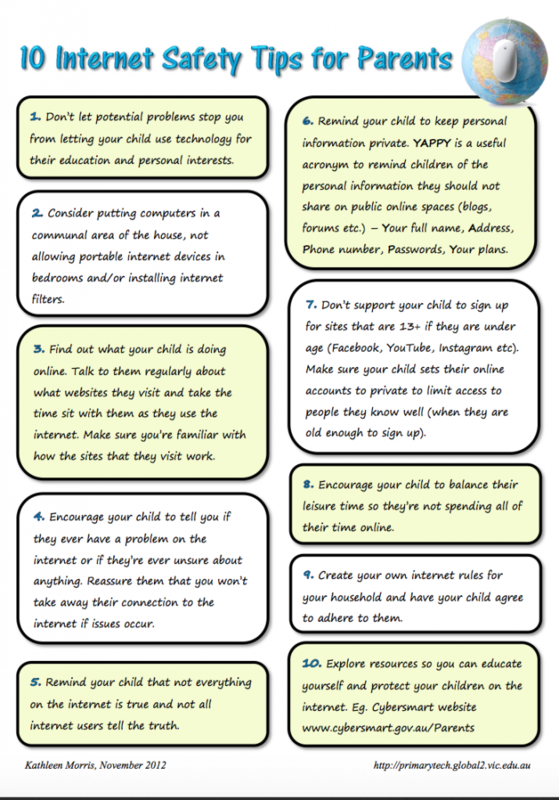 The following posters, developed by Kathleen Morris (http://primarytech.global2.vic.edu.au/2012/11/08/internet-safety-posters/), are very helpful in supporting students and families’ understanding of Internet safety. Cybersmart is an excellent Australian Government website that provides information and activities related to safety online. 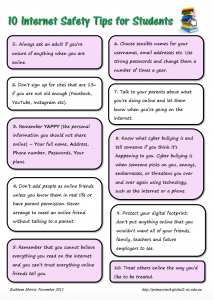 In 2016, our students will be participating in an interactive presentation offered by Cybersmart, Play Your Part For A Better Internet, in the context of Safer Internet Day. This fantastic video from Joaquin Jutt via CommonSenseMedia gives us insight into the concept of digital footprints and how we can ensure that our digital footprint remains a positive one. Common Sense Media: Digital Footprint Intro from Joaquin E. Jutt on Vimeo.